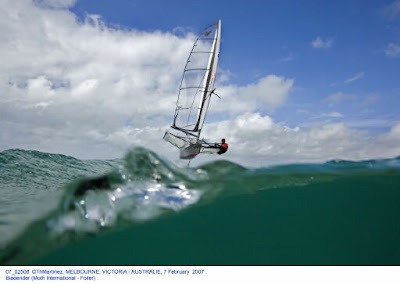 Shots by Thierry Martinez of Rohan Veal sailing the Bladerider X8 International Moth. So there you are screaming down the run in Tacticat trying to keep out of the way of the Tactifools gybing and capsizing and steering all sorts of unpredictable courses and before you know what's happening the leeward gate is coming up fast and there are crowds of boats stopped, crashed, tacking, gybing, swirling around each mark like a swarm of bees and you have to make a decision about which side of the gate to round in about three milliseconds and........ disaster strikes. And even though all the other advice you have read here about Tacticat sailing hasn't helped you one iota you are back here again for some help on how to deal with the leeward gate? Never learn, do you? Which side of the gate is further upwind? Check the wind direction using the indicator in the top left-hand corner of the screen. Obviously if you round the upwind side of the gate it is as good as starting a race at the favored end of the line. You are already ahead of all the Tactichumps rounding the other mark. 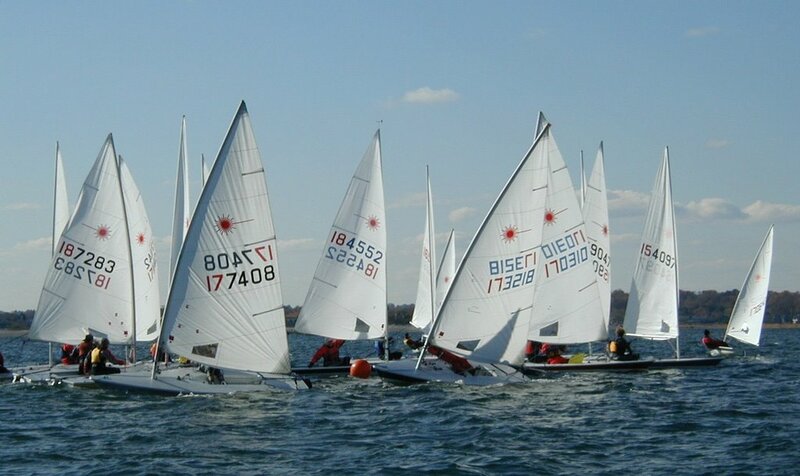 So make your mind up well before you approach the gate and position yourself to approach the desired mark, preferably on the inside of those 17 other boats that rounded the windward mark with you. Slow down and hope the mess clears quickly. Aim for that tiny gap between the inside boat and the mark, get penalized for hitting both, and then spend the whole of the second beat complaining about how unfairly you were treated. Take the long route around the slow boats going nowhere. Change your mind and make a nice close rounding of the other mark and sail away in clear air with time to hit the M key and leave a sarcastic comment for the 23 other boats still stuck on the mark. And in case you think this has nothing to do with real world sailing then let's see what a real world real expert has to say about real gates. However, sometimes weird things happen at a real world gate that would never happen in Tacticat. So what have I missed? Anything else to say about Tactigates? If I still lived in the UK and if for some reason I grew tired of racing a Laser then I suspect I might seriously consider switching to the Laser SB3. Not because it has the Laser trademark but because it seems that it retains so much of the Laser philosophy of combining fun, convenience and strict one-design rules. More information here and a couple of videos here and here. But I live in the US (where there is no SB3 activity as far as I know). And after 25 years my enthusiasm for the original Laser shows no sign of flagging so I guess I will stick with it for another 25 years. 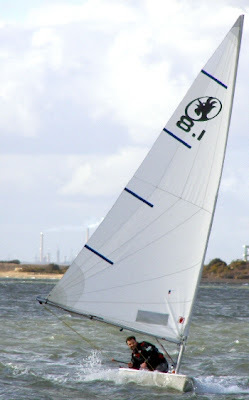 Steve Cockerill at Rooster Sailing has come up with a more powerful rig for the Laser, the Rooster 8.1, that claims to deliver "amazing performance" and would suit anyone over 90kg. I see he hopes to develop a racing circuit and a national championship in the UK. Hmmm. Wonder if it will ever take off in the US? Perhaps I should volunteer to be President of the US Rooster 8.1 Class Association? So the race is going pretty well. You made a good start, did well on the beat by watching the wind and heading for the side of the course with more pressure, found a good lane and sailed the whole beat in clear air, stayed out of trouble by avoiding the idiots, bots and other general mayhem, avoided getting trapped on the port tack layline, judged the starboard tack layline perfectly and rounded the windward and offset marks with the leaders. Now you're ready to sail the run and you've come to Tillerman's blog to seek advice. What? You must be joking. Sure. There are places to be gained and lost downwind in Tacticat. But it's the part of the game that I understand the least. So I will expose my ignorance by telling you what little I do know and perhaps some more experienced Tacticat players will tell you their secrets in the comments. If there is more wind on one side of the course go there. Sail the headed tack -- the one heading more in the direction you actually want to go. Think about the leeward mark rounding. Which side of the gate will you round and how will you approach it for maximum gains. (More on this in the next Tacticat Tip). Unlike real sailboat racing the end of the run will come up much faster than you think. Or to be honest much faster than Tillerman can think. 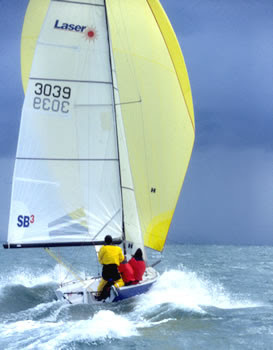 The actual technique for downwind sailing varies a lot for the three different kinds of Tacticraft. 1. Tacticats. Tacticat catamarans are boring. (Or am I missing something). Head down to the "sail by the telltales" course by hitting space bar. Is there any more to know? As I said, Tacticats are boring. 2. Tactiskiffs. Tacticat skiffs are the opposite of boring. They will capsize at the slightest opportunity downwind. So hoist the kite and prepare to swim a lot. In a blow the person who capsizes the least will win. Head down to a dead run. Try sailing without the kite. Beyond that I know nothing. 3. TactiLasers. Ahah. The most popular boat to race in Tacticat (and in the real world). To be honest the TactiLaser doesn't behave exactly like a real Laser downwind (except perhaps when there are real world waves). The best way to sail the TactiLaser is to start it planing and keep it planing while sailing as deep an angle as you can. Avoid excessive rudder movement. Use the space bar to bear away rather than down arrow or page down keys. Use the I or E keys to display your speed and keep it in the range that planes. Sound easy? See you at the windward mark later. Update: Apparently some of the above is crap. Check the comments for real expert advice. I sometimes wonder if I don't take sailing seriously enough. I know some readers of this blog become frustrated when I veer off-course into flights of fancy about urine tests or church signs. The number of posts already labelled Utter Nonsense is a testament to this weakness of mine. 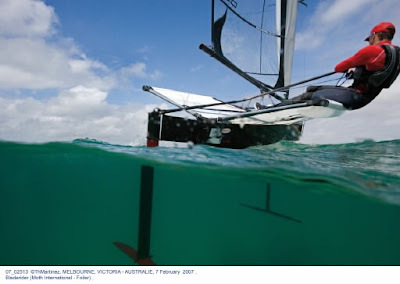 But then I came across this post Carrot Fibre Yachts on the official blog of the America's Cup Challenger Commission. Hmmm, maybe I'm not so different from these elite sailors after all. Seems like we can all take our sport seriously and laugh about it occasionally too. Seems like I'm not the only Laser sailor that appreciates Cabarete. How do we value ourselves? Some folk take pride in how well they have managed their investments or in the supposed value of their houses or in how far they have risen up the ladder in their careers. Students (and parents of students) compare their grades or their test scores. Athletes are obsessive about numbers. Runners talk about their personal best at their favorite distance. Baseball players compare minute differences in batting averages or earned run averages. Golf players brag about their handicaps. Elite sailors can look at their ISAF rankings, or their performances in the last big regatta, or how many world championships or Olympic medals they have won. Numbers, numbers, numbers. We all want to keep score. Even we puny winter-time Tacticat sailors like to see our names up there in the Top Ten. Someone even left a note on their blog today pointing out how well I was doing at that silly sailing game. My little chest puffed with pride. We are VERY sorry to announce that due to a database corruption and our bad habit to forget to backup, ALL RESULTS OF LAST 15 DAYS ARE LOST. The responsible will suffer punishment and humiliation from the rest of Tacticat team. We all lost our rankings. Our numbers are gone. Our achievements are deleted. It's a reminder of what really matters in life. Health. Family. 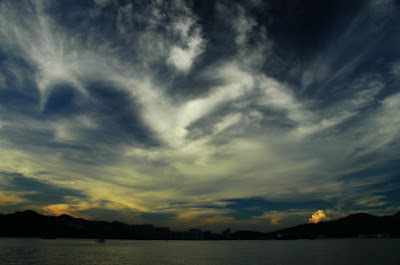 And the time to enjoy looking at the clouds. Update: Thanks to soulsailor for the link to the Cloud Appreciation Society. 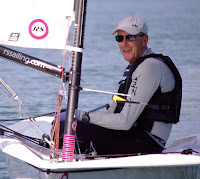 Fellow Laser sailor and blogger ab wrote a post 365 Days last week in which he takes stock about whether he is on track to achieve his goals for the Laser World Championships in Australia in one year's time. His answer is no. Not enough sailing. Not getting to the gym or out on the bike. I know how he feels. 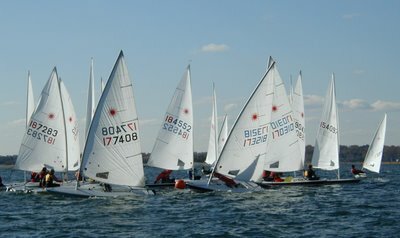 In September last year I set myself a goal for the Laser Masters Worlds in Spain in September this year but by November I was already asking myself in Commitment Questions about why it seems so much easier to stick to my marathon training program than to a program for training to become a better sailor. Like ab I too feel than I'm not on track with what I need to do to achieve my sailing goals. There are positives for sure. I had some excellent weeks of practice in Menorca and Cabarete with some high quality input from coaches on what I need to improve. On the other hand I haven't done as much sailing at home as I had hoped in the last few months. Nor have I worked much on my fitness other than cardio and endurance work through running. However I am still on track with my training for the London Marathon in April. Completed the 23 mile run on Saturday with nothing worse than the normal expected tiredness. Only two more long runs to do. I really feel I'm going to make it. Outside there is snow on the ground and the lake is still mostly frozen. The wind chill today is below zero Fahrenheit. 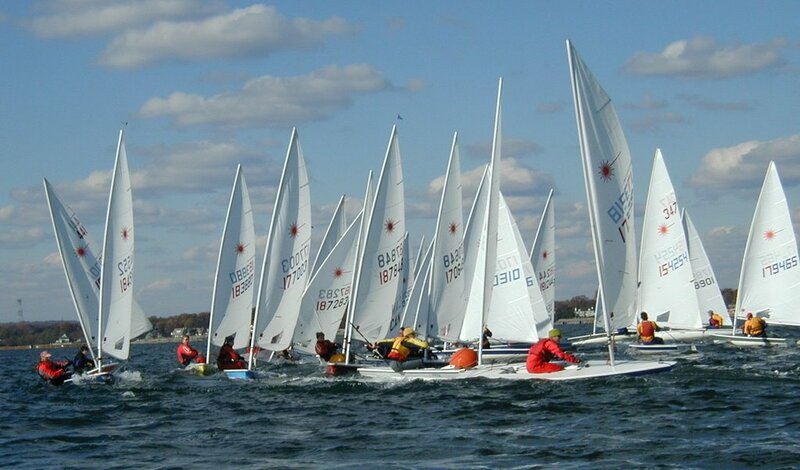 The good news is that the Laser sailing season at my frostbiting club starts two weeks on Sunday. Can't wait. 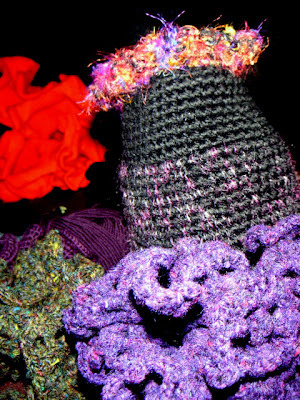 Today's competition: what is that picture? 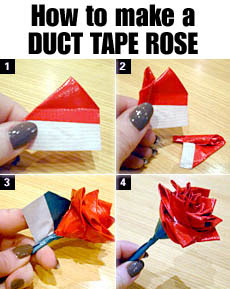 Free instructions on how to make a rose out of duct tape to the winner. One of the beauties of the Interwebs is that you can find an interesting article from an area of your interest that has a link to a related topic that branches off to another fascinating theme that somehow connects to a totally different subject in which you are also interested. That's how I found that photo. Clue: The topics along the trail to that picture included a discussion on science writing and a website of someone interested in hyperbolic geometry. So if all the boats in Tacticat are sailing at the same speed, why is that some of them seem to pull ahead in the race and others fall behind? It's just like real estate. The answer is location, location, location. Or as Stuart Walker would say Positioning: The Logic if Sailboat Racing. I already wrote a post about one way to go faster: find the stronger wind. Another vital key to boatspeed and racing success in Tacticat is to sail in clear air. Don't get caught in the wind shadow of another boat. Just like real sailboat racing again. It's actually easier in Tacticat than it is in real life to know if you're in another boat's wind shadow. Hit the S key and you will see the shadows cast by every boat. And if you hit the E key you will see a text display of various aspects of boat performance. The percentage shown against the word "Free" will be 100% when you are sailing in clear air and less if you are in dirty air or a wind shadow. So when should you check if you are in clear air? Basically any time you are near other boats. Upwind and downwind. When you tack or gybe. When boats tack or gybe on your wind. Working upwind you want a lane where you will have clear air. Downwind you don't want another boat on your wind. Immediately after the start you need clear air. After you have rounded a mark you want clear air. Think about it. Plan ahead. What will you do if that boat tacks on your wind? Where should you tack to approach the mark in clear air? To me this is one of the most valuable teaching aspects of Tacticat. It is constantly letting you know how to position yourself with respect to other boats to keep your wind clear. After a while playing it you will absorb the lessons and positioning will become second nature. Do you have a lane which enables you to tack on every shift and still be in clear air? Should you tack before or after that boat near to you? It will all become natural the more you play. And then it will become even more interesting because you will move on from playing a defensive game and start to become aggressive about using your wind shadow to slow down other boats. Be mean. Be nasty. It's fun. And just to reinforce my message that looking for clear air in the silly game of Tacticat will serve you well when you play the equally silly game of real life sailboat racing, here's an article from Sailing World about Top of the Beat Tactics. Location, location, location. Be a "vulture". Regular readers of this blog will know that the author has a serious duct tape fetish. At various times I have promised instructions on how to make a duct tape cup-holder for your yacht. Today I go one better. If you have forgotten to buy your beloved a romantic gift for Valentine's Day, here are full instructions (thanks to the Duct Tape Guys) on how to make the offering she will remember for ever, a duct tape rose. Cut several strips of duct tape – about 2 inches each. Sticky side up, fold one edge over itself, leaving some stickiness on the side and bottom. Repeating steps 2-3 with strips of duct tape, loosely bind the strips around the center (these are your petals). Continue until you’ve reached the desired size. My last Tacticat Tip was about the dangers of approaching a crowded windward mark on the port tack layline. So here's the bad news kiddies: even if you approach the mark on starboard tack you can still screw it up and lose many places in the race. The easiest way I find to achieve this disgrace is when I approach the mark just shy of the layline with boats to windward of me or on my windward hip so I can't tack twice to clear the mark. So I try and shoot the mark and end up hitting it and maybe fouling a windward boat too. I lose way, stop altogether, start drifting backwards as other boats start piling into the traffic jam at the mark that I created. By the time the mess clears the rest of the fleet is sailing down the run. So why would you approach the mark shy of the layline Tillerman? You may well ask. Sometimes it's because when I approach the parade of boats on the starboard tack layline I am tempted to tack below them rather than find a gap to sail through. Or maybe when I tacked on to starboard tack I was above the layline but then there was a header. It's easy to do, believe me. Done it many times in Tacticat. So learn from my mistakes. Think ahead. Is the wind oscillating? Are you likely to experience a header before reaching the mark? Also, try and find a slot in the starboard tack parade where you have freedom to tack out again if the worst happens. Easy to say, harder to do. 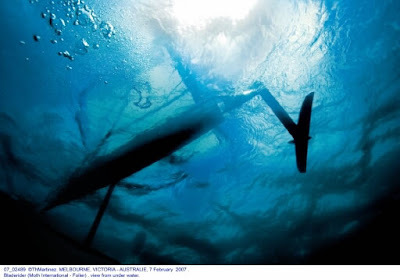 And just to reinforce the point that it's not only crap Tacticat sailors like me that can make this mistake, here's another post from CampbellSailing.com where Andrew owns up to a similar error in real world sailing. Do other Tacticat sailors have this problem? Do you have any other tips on how to avoid it? Last Friday I was surprised to get a call from the renowned sailing broadcaster and writer Barry Dobson who wanted to interview me. Here is the full text of the interview (which probably won't be appearing in Sailing World any time soon). BD: Congratulations Tillerman on your second place finish in the Altea Cup. Tillerman: Thanks very much Barry. There was some tough international competition and I was lucky to be able to string together some consistent results. What was your strategy for the regatta, Tillerman? Well Barry, I figured that with a large fleet and a short course it would make sense to start at the starboard end of the line and stay to the right of the fleet. I didn't want to get trapped on the left and end up coming to a crowded first mark on the port tack layline. Also with no throwouts in a three race regatta it would be important to sail clean races and stay out of trouble. So I started near the right-hand end of the line, tacked out immediately for clear air, and then headed for the side of the course with better pressure. Well it certainly seemed to work for you. What about your equipment? Glad you asked Barry. I've been very pleased with my decision to use the Dell loft in Austin. I think the wider cut of the Inspiron 6000 series is a definite plus downwind and the crisp keyboard action helps in the tacks and gybes. All my lines are by Cablevision, specifically the Optimum Online range. Their reliability is excellent. You can't afford to have a line breakage in mid-race. Any special preparation for the regatta, Tillerman? Oh yes Barry. I always give my screen a polish with isopropyl alcohol before an important race. You know what they say: a clean screen is a fast screen. And I trained hard in the days leading up to the regatta. A lot of the credit must go to my training partners, Guest_23 and Guest _47. Those guys are awesome. What was the highlight of the regatta for you, Tillerman? No question Barry, it was the end of the first beat of the second race when I was approaching the windward mark in second place right behind my sailing hero, Litoralis. Why is he your hero? Barry, need you ask? Lito was the brains behind the Tacticat Laser!!! That puts him right up there with Bruce Kirby and Julian Bethwaite in my book. And as a Tacticat sailor he is in a class by himself. Let me give you an example. We were sailing together in a practice race a couple of days before the Altea Cup. We were luffing below the line just before the start and he told me to "Go". Well, when a sailing superstar like Lito says go, I go. I accelerated to the line, and it was amazing, he had timed it just right so that I was OCS and he had a perfect start. What an evil genius! I try and emulate his style of aggressive sailing but I think you just have to be born with a mean streak like that. Who are the other sailors you admire? Well, windvane of course for winning the regatta. And trencher, always up there in the rankings. And dwsc:Foiler, he has amazing downwind speed. Oh, and pudge.... how many other sailors' names have become verbs as in, "I was pudged at the start"? Why are British sailors doing so well in Tacticat? It's all the support we get from the National Lottery, innit. So how much funding have you received from the lottery, Tillerman? Sorry mate, that's a state secret. If I told you, I'd have to kill you. Thanks for the interview Tillerman. For today's Speedlinking Saturday post, check out the debate that has been rumbling on in the past few days about Rule 42, cheating, ethics, Laser sailing kinetics techniques, pushing the line... all triggered by what happened to Paige Railey at the Miami OCR. We touched on this topic here in Pushing the Limits and the comments to that post covered a broad spectrum of reaction. Paul Henderson, former ISAF President, weighed in on the issue on Sailing Anarchy in an interview with the headline Hendo on Cheating. 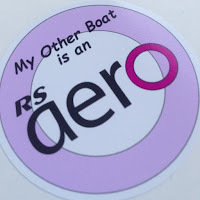 This triggered a lengthy debate in the Sailing Anarchy forums that expressed about every possible view it would be possible to have on the subject from one extreme to another. But perhaps the most reasoned discussion on the matter came in a second post by Craig Leweck on Scuttleblog titled Is it a question of ethics? I'm still confused about my own reaction to Rule 42 violations. It annoys the hell out of me when I see other sailors breaking the rule. But I still can't see logically why 3 yellow flags at a regatta is somehow more morally reprehensible than 3 OCS scores. Tillerman's Tacticat Tip #4 is Beware the Port Tack Layline. Here's the scenario. Before the start in Tacticat it looks like the wind is stronger on the left side of the course. You read Tillerman's Tacticat Tip #2 Watch the Wind and so you decide to start near the pin end of the line. You get a good start but boats to the left and right of you get slightly better ones. 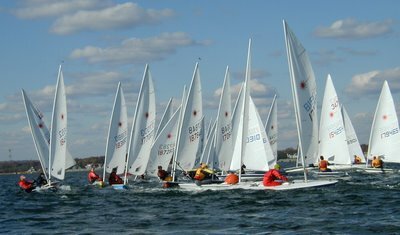 As you head out to the left side of the course you never extend far enough ahead of the boats to windward of you to be able to tack and cross them safely. Eventually he gets the message. He and the six boats to windward of him flop over on to port, but by now you are on the layline, or perhaps even above it. Worse, it turns out that there was some decent pressure on the right too and some of the boats that went right are going to cross you. There are already fifteen boats lined up on the starboard tack layline and you can't see any gaps in the line. Now you're approaching the mark.You can't tack inside the starboard tackers; they are too close to the mark. What are you going to do? Bear off and duck a dozen or more boats? Sheet out and wait? There are boats ahead of you on starboard. There are boats to leeward of you. There's nowhere to go. You're screwed. So how do you deal with this situation and get around the mark cleanly and still be up with the leaders? Beats me. Basically you can't get there from here. I guess you should have anticipated the problem earlier and maybe slowed down earlier so you could tack on to port, duck some transoms and get into the starboard tack parade before all the gaps filled up. If it makes you feel any better this happens to top sailors too. Check out this Monday Morning Tactician tale from CampbellSailing.com. Andrew thought he had an opportunity to round the mark with the leaders but ran into extra complications caused when another port tacker stole a late inside overlap. Diagram stolen shamelessly from CampbellSailing.com. Tillerman's Tacticat Tip #3 is Stay out of Trouble. What do I mean? Well, just go to Tacticat and enter a "field" where 20 or more boats are racing. Sit back and watch a couple of races. What will you see? Even before the start, boats will be crashing into each other. Those boats with red dots on them are the ones that Tacticat decided were at fault in the collisions and they will be penalized by being forced to sail more slowly at the start. Then there is that crowd of boats luffing at the right end of the line, hitting each other and the buoy. More boats trying to start at that end are smashing into the back of the boats at the buoy in a forlorn attempt to sail through them. There goes the start signal. Off they go. Now boats are trying to tack from port to starboard and fouling other boats. There's a boat on port trying to cross a starboard tacker and failing. There's a clump of three or four boats all stuck together and going nowhere. Look, now the leaders are lined up on the starboard tack layline to the windward mark. Port tackers are trying to cross that line of starboard tack boats and fouling them. Oops. Now a boat is stuck on the windward mark and other boats are piling into her. There go the leaders off down the run. The best sailors are planing. Here come the six leading boats on a screaming reach approaching the gate, some on starboard, some on port. Ouch. I daren't look. Total mayhem. You get the picture. Half the competitors (at least) are putting themselves out of contention through collisions with other boats, trying to sail through other boats, hitting marks, etc. etc. So the best thing you can do when you want to do well in a Tacticat race is just... stay out of trouble. Watch out for starboard tackers. Look out for packs of boats stuck in a raft on a buoy ahead of you and sail round them. Even if you have the right of way you can't sail through or over other boats and you will lose distance. Stay sharp. Keep your eyes open. Sail safe. Does this bear any relation to real sailboat racing? Sure. Just ask this young man. 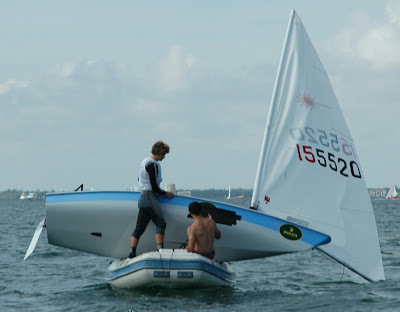 Thomas Barrows took a first place finish in the recent Miami Olympic Classes Regatta but then disaster struck when an oncoming boat at full speed T-boned him and put a hole in the side of his Laser the size of a small water-melon. The photo shows the subsequent repair in progress. It's amazing what you can do with duct tape. Update: I didn't know when I first wrote this post that the coach repairing the boat is Rulo from the Laser Training Center in Cabarete. Rulo is an amazing coach and was hired by five sailors to aid them at the OCR, including Thomas. With all due respect to duct tape one also needs the brains and imagination on how to apply it. Also, the details of how to get the Laser on to the RIB for the repair does not come with the duct tape roll instructions manual. Thanks to Sailing Anarchy for the story and photo from the OCR. I know that a fair number of visitors have come here the past few days from the Tacticat site, thanks to a nice booster link for Proper Course prominently placed on Tacticat. Thanks for that Senor Tacticat. But, so far, my visitors from Tacticat have been totally silent here. Maybe they find my posts on Tacticat tactics boring? Or maybe they don't understand how this blogging thing is supposed to work? Hey guys, it's all about community. We bloggers don't just write all this stuff so that our words can disappear into the aether with no response. I know, I know. Einstein disproved the existence of the aether. I was speaking metaphorically. Oh yes. Please take the time to leave a comment and let me know what you think of my Tacticat tips. I've only been playing the game a few weeks so I'm certainly no expert. My exalted place in the top ten in the Tacticat rankings this week is entirely due to my amazing sailing skills, not through superior knowledge of the game. That, and being retired and being able to race any time there are enough players there to give me some decent scores, but we don't mention that. Where was I? I seem to be rambling off subject a lot today. Oh yes. Please leave a comment here. You don't need to sign up for a Google account. Click on that sad "0 comments" link at the bottom of a post, use the "Other" button under "Choose an Identity", enter your Tacticat boat name so I know who you are, and leave a comment. (Or comment anonymously if you're shy or want to be extremely rude) . Disagree with me. Tell me something I don't know. Tell us your secrets for achieving a perfect start, or smelling the wind, or whatever. I know you have a voice because some of you talk to me on Tacticat when we're racing. We'll be going up the first beat and you'll send a message saying something like "great blog Tillerman". I appreciate it. I really do. And being a polite kind of guy I feel obliged to reply. Just to say "thnx" or something equally cryptic. But that means I have to take my eye of the screen and look at my keyboard. And move my right hand from hovering over "Enter" to find the "M" key. And move my left hand from its normal position glued to "Z" and "X" in order to find "T". And you always seem to want to tell me about my blog just as we are heading into a crowded windward mark rounding. You couldn't be trying to distract me, could you? So thanks for the kind words about Proper Course. But, as I have ten thumbs and am keyboard-dyslexic, please don't chat to me in the middle of a race. I am unable to walk and chew gum at the same time. Let's chat between races. Or even better leave a comment here. Talk to me. Please. Tillerman's Tacticat Tip #2 is Watch the Wind. Remember, in Tacticat, other things being equal, all boats have the same boatspeed. You can't beat your competition around the course like you do at your home club in real world sailing by just having a boat that's tuned better or by having superior boatspeed due to your amazing helming skills. In Tacticat if two boats are sailing in "sail by the telltales" or automatic mode, and they are both in clear air, then the boat in stronger wind will be faster. So one of the best ways to edge out on the rest of the fleet is to find that stronger wind. As far as I know there are only two ways in Tacticat to "see" the wind velocity. The other method is to use the I key which enables you to display the wind velocity for all the boats racing. So then you can check out whether the guys on the far side of the course are in stronger or lighter winds than yourself. So in Tacticat everyone can be a 2 on Tillerman's spoof Not-the-Beaufort Wind Scale. Anyone worked out yet how to be a 1 in Tacticat - i.e. predict the wind before you can see it on the screen? Check where the wind pressure is before the start. Develop your start strategy with this in mind. Keep checking the wind. It does change. Check it before the start of every leg. It may determine which side of the course to sail on the run, which gate mark to round, which way to go on the second beat. Keep an eye on the wind direction too. 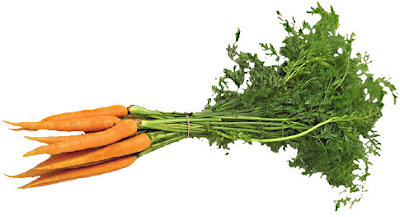 There are persistent shifts and oscillating shifts and sometimes both. Use them, just as you would in real world racing. I always keep the laylines of my boat displayed (Y key) and tend to judge the shifts from watching the laylines move. There is also a wind indicator on the top left hand corner of the screen which shows which way the wind has shifted and by how much. One of the things I appreciate about Tacticat is that it is much easier for me to see immediately what is happening to wind velocity around the course than I find it to assess in real life. So I can make tactical decisions based on what the wind is doing and observe the effects immediately. Teaches me to get better at observing the wind in real racing. I hope. Hey, there's got to be some payback for all these hours I have spent this winter wearing out my Shift and Enter keys! Geeze, how many T's is that? Guess we will have to call this T6 #1. OK. T6 #1. Get a Great Start. What? That's the amazing insight we've been waiting for? Yup. Racing in Tacticat (at least in this respect) is just like real world sailboat racing. The start is a huge part of the race. Get a good start and you will likely end up in the top five. Get a crap start and you will be sucking for air and will be struggling to get back in touch with the leaders. OK. OK. So how do I get a good start in Tacticat? with freedom to tack when you need to. Yeah, yeah, yeah. I know all that. But how do you manage to achieve all of the above? Not a lot. OK. Maybe a few things. 1. Squirrel Starts. This is where you hang out near the right hand end of the line hoping that at the last minute a gap will appear in the pack of boats luffing on the line near the buoy and you will be able to power through that gap just as the gun goes off. This is a great move if you know the right side of the course is favored. (More on that in another post.) As Tacticat courses are pretty short it's also an advantage (other things being equal) to be on the right side of the fleet with starboard tack advantage coming in to the first mark. I would say that some of my best races have been achieved with a squirrel start. Litoralis is a master at this on Tacticat; I will be fighting my way through traffic and then look up the course to see that he has found a gap, blasted through, tacked, and is already several boatlengths ahead of the pack heading towards a puff on the right side of the course. How does he do it? Just as in real sailboat racing, squirrel starts are a high risk, high gain strategy. There are just too many ways you can screw up a squirrel start. Or at least, that I can. 2. Be a Shark. This is where you cruise down the line looking for a gap, head up into it at the last minute, sheet in, accelerate, time the start perfectly, win the start and win the race. Works sometimes. Unless you're too late. Or too early. Or hit somebody. Or there are no gaps left. Go on. Try it. What do you have to lose? 3. Protect Your Hole. OK. So you decide to go for a conventional start. Line up with all the other guys, luffing a boatlength or so below the line. Try and maintain a gap to leeward so you can bear off and accelerate a few seconds before the gun. Try and be bow out on the boats to windward and to leeward without being OCS. This will work if your timing is good. But in Tacticat, at present, there is a huge potential problem for boats just hanging out below the line. Another boat can come in to leeward and just tap your leeward quarter and you will get the penalty. In real sailboat racing this doesn't happen because under Rules 15 and 16 the leeward boat has to give you room to keep clear. And you do not need to start taking evasive action until the overlap is established. However, the software in Tacticat doesn't seem to allow any time for the windward boat to respond. There has been some discussion about this on the Tacticat forums and I suspect this issue may get fixed in a future version. But, for now, be very very wary of boats approaching to leeward before the start. Many of the regular racers are good guys who play by the real rules. But there are some nasty characters out there who will deliberately cause you to take a penalty just before the start by coming in to leeward and tapping you. I don't really know a total solution to protect yourself from this. Clearly setting up to windward of another boat, close but not too close, will discourage many of these pitiful creatures. So, just as in real sailboat racing, protect that hole to leeward at all costs. Funny. Even the top Laser sailors have problems with idiots jamming into that gap to leeward. Check out Andrew Campbell's story of an incident at the Miami OCR that cost him dearly. Maybe Tacticat is pretty true to life after all. 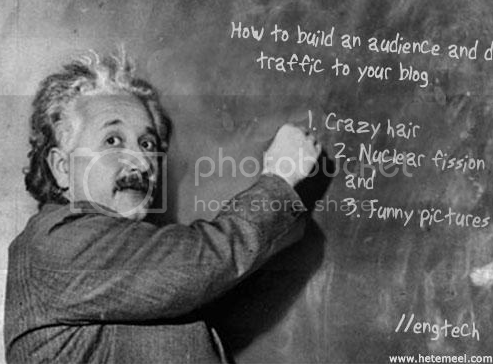 Be the first to write a post about the ‘Top Ten Blogs’ in your niche. The post will rank highly in any general search for blogs in your niche and other bloggers in your niche will write about the post and link to it. It's true. My posts on Top Ten Sailing Blogs of 2006 and ditto 2005 have been two of the most popular posts on Proper Course. Just discovered bLaugh the self-described (un)official comic of the Blogosphere. On a more serious note, BMW Oracle Racing Team has a post on how many boats the yacht America beat in the first America's Cup match. Apparently everything you read on the Internet isn't absolutely true. Even Wikipedia had this one wrong. What a shocker! For the escapists, Kanker Greenacre teaches sailing in Second Life using a virtual boat based on on the Flying Scot. And then we have the ultimate New England getaway location for a yachtie type: a Nantucket Lightship. And finally a fascinating article on that affliction of many sailors Two-Foot-itis. I have been spending way too much time over the last few weeks playing Tacticat. As I suspected when I first discovered it, it's seriously addictive. Tacticat is a multi-player online sailing simulation. Typically up to 24 players (sometimes more) will race against each other around a two-lap windward-leeward course. There are simulations available for Lasers, catamarans and skiffs. It's not perfect. What simulation is? But the site administrator is very open to feedback from players and is constantly tweaking the simulations to make them more realistic. The more I play Tacticat the more I realise that it demonstrates and teaches some very valuable tactical lessons that are useful on the real world race course. And then I realised that several of these lessons were almost exactly the same ones that Andrew Campbell has been teaching us in his Monday Morning Tactician series on CampbellSailing.com. So I am going to write a series of posts next week on Tacticat Tactical Tips. These will discuss some of the things I have learned so far about how to be a successful player on Tacticat; and most of them will link to articles on Andrew's site showing how this lesson applies to real world sailing too. Lest you doubt my credentials to speak with authority about Tacticat let me point out that today I am ranked 14th out of 813 registered players on the game. Not too shabby, eh? 1. "I know what will happen." These are the sailing superstars who seem to have a sixth sense for what the wind is going to do, way before we mere mortals have any clue. They just know that the left side of the course will be favored or that the sea breeze will kick in at exactly 1:50 pm. 2. "I can see what will happen." Blessed with excellent eyesight, these are very good sailors who can look up the course and see that a big righty shift will be here in seven minutes. 3. "I know what happened." These are the average sailors with little ability to predict the wind, but at least they know what to do when the wind changes. They can recognize the difference between oscillating and persistent shifts, and know whether to tack or not on a header. They can change gears when the wind velocity changes. Where do you rank on the 5 point scale?